Who has the biggest desire to Travel? Our friends at GoAbroad.com, one of the leading meaningful travel related sites on the web (a useful resource for those looking to teach English abroad) recently published this lovely little infographic breaking down their search traffic by location, age, and gender, among other qualifiers. It made me think, how much does ones environment impact his or her desire to travel? It’s certainly true that some people just have the bug, and others don’t. Why is that? It’s a complicated question, and this graphic can only begin to scratch the surface, but it provides some interesting fodder. We can assume that people searching on GoAbroad have at least a somewhat strong desire to travel. So what, if anything, does this data tell us? It immediately jumps out that California has by far the largest search volume on the site. That doesn’t tell us much, as California has by far the biggest population in the United States. So, pretty much a moot point right there. Going by population, we might expect Texas, with the second largest population in the states, to be #2 in travel related search volume. Instead, it’s New York (third largest population in the US) at #2, with Texas coming in at #3. Does this suggest that liberal leaning states are more likely to raise individuals with a strong desire to travel? It’s a fairly logical conclusion to make, but what does this data say? Other big population states like FL, PA, OH and IL are up there in search volume too, but that’s pretty much where the population correlation ends. Then we have traditionally liberal states like MA, CO, WA and OR showing up with dense search volume, while more conservative leaning states like NE, WY, SD and MS seem to have much lower travel search indexes. So, this information does seem to support, roughly, the idea that living in a more liberal minded area of the country increases one’s desire to travel. We can’t make too many strong conclusions based just on this data, as there are a great number of other factors at play. For example, states with higher search volumes might very likely have higher concentrations of universities where GoAbroad is heavily promoted, obviously increasing web traffic in those areas. But it is an interesting thought. Are liberal states more apt to “outside the box” thinking, such as spending a year teaching English abroad, or volunteering in a foreign country? Does a person with a strong desire to travel that happens to live in a politically conservative state face more roadblocks along the way, from parents, peers etc? I’m not sure what the answer is. 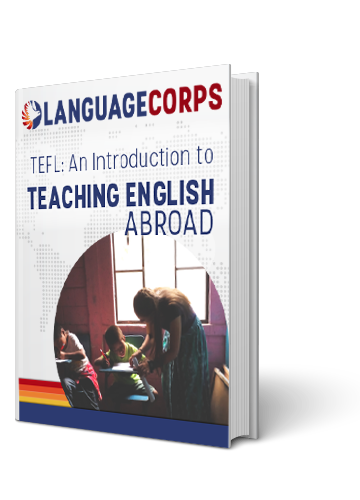 I know that at LanguageCorps, we have helped people from all different backgrounds, from every state in the US and many foreign countries as well, to have meaningful experiences teaching English abroad. We certainly see trends in the type of person that more typically chooses to spend an extended period of time living and working abroad, but not to the degree where we can really make any type of sweeping generalizations. That the websites biggest demo is 25-34, followed by 18-24 is is to be expected, but I did find it interesting that over 60 percent of GoAbroad’s search volume came from females. We see a similar female-male ratio in some of our web traffic statistics at LanguageCorps, but in practice, our programs are typically a fairly even male-female split. I wonder if we are an exception, if females are more likely to conduct research into extended travel, but at the end of the day, males and females are pretty equally likely to actually go through with their plans to live abroad. Again, I can’t make any conclusions, but it’s interesting to consider. So what do you think? Is there a typical profile for the type of person that has a strong desire to travel?